Rudy Burckhardt (1914-1999) is known for his smart pictures of New York City, finding formal elegance in sidewalk grates as well as in streetscapes of prominent buildings. The pictures of children at De Nagy haven't been shown before, and although the subject matter is not familiar, the Burckhardt touch is. The children in these 15 pictures were found in Tetuan, Morocco; Naples, Italy; Curaçao; Mexico; Montgomery, Ala.; and Queens, N.Y. Most of them are street urchins, to use a contemporaneous term. What distinguishes the images is the sophisticated way Mr. Burckhardt placed the children in formal contexts related to their environment. The use of perspective is critical. "Untitled (Tetuan, Morocco) 1955" has three barefoot boys standing on what appears to be the ancient wall above an uninhabited village of stone houses. In "Three Children (Naples, Italy) 1946" the photographer looks down at the children, who are arrayed on a stairway that leads to a street far below. 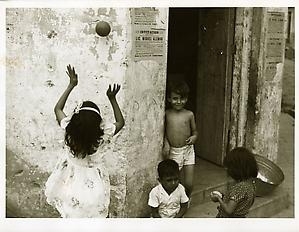 In "Untitled (Mexico) 1946" the kids play in the foreground on a dirt street that curves away in the distance. And in "Untitled (Queens, New York) 1940," children play in the middle of a deserted street in a mixed industrial and residential area: The kids are backlit and the street slopes up with only one car in the remote distance. In all his pictures, Mr. Burckhardt treats the children with sympathetic delicacy.